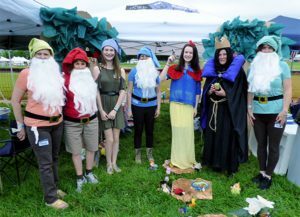 The tailgate theme for the 2019 Fair Hill Races is The Roaring '20's. Judging will start @ 12:00 noon. 1st Place Trophy and $100 off of next year’s tailgate spot. One winner for South Tailgate and one for East Tailgate spot. 2nd Place Trophy and $50 off of next year’s tailgate spot. 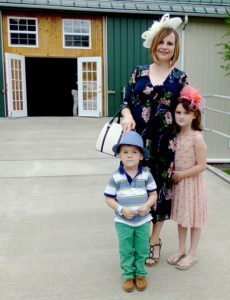 Hat judging will be held on the Tea Barn ramp @ 2:00 p.m.
Over 16 years of age: Two Reserved seats for 2019. Under 16 years of age, Two Reserved seats for 2019. 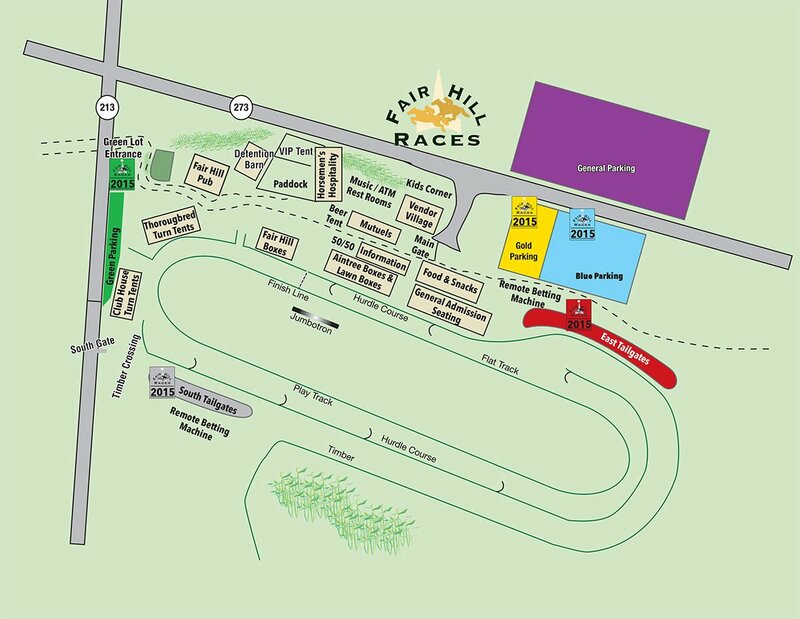 Note: Contributions or gifts made to the Fair Hill Races ARE tax deductible as charitable contributions to the extent permitted by law. Please consult with your tax advisor. All betting and cashing transactions may be handled at any pari-mutuel window. You may bet any dollar amount over the minimum wager. 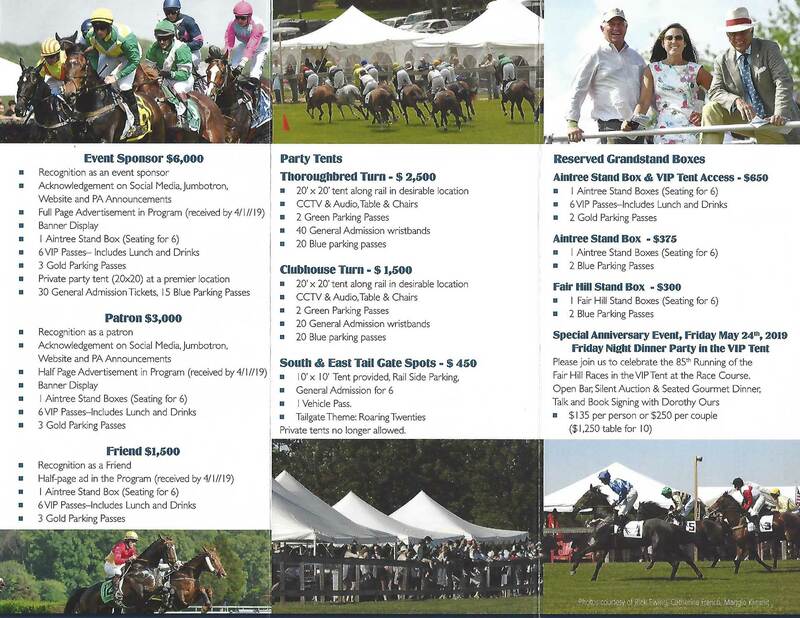 Please call your bets in the following order: 1st - state the race number you wish to bet on, 2nd - state the dollar amount you wish to bet, 3rd - state the type of wager, 4th - state the program number(s) of the horse(s) that you wish to bet. Example: "4th race, $2 to win on number 5" or" 2nd race, $10 to show on number 1" BEFORE LEAVING THE WINDOW: Make certain to check your tickets and count your change. HOLD ALL TICKETS UNTIL RACE IS OFFICIAL. In case of objection or disqualification, do not throw away or try to cash your tickets until the race is "official". To win a Daily Double, you must select the winner of the first half and the second half of the Daily Double on a single ticket. This bet must be purchased PRIOR TO THE FIRST DESIGNATED RACE OF THE DAILY DOUBLE Race 1 or Race 6. 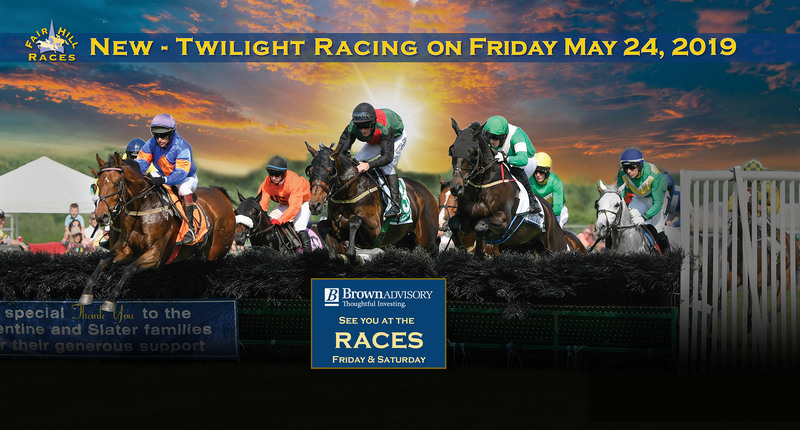 To win an exacta, you must select horses that will finish First AND Second on a single ticket. The two horses must finish in the exact order. Please note that this race is also called "Perfecta" at some race tracks. Example: Fair Hill, 3rd race, $2 on exacta #2-4. To win a Trifecta, you must select the horses that finish first, second AND third, in the exact order on a single ticket. Example: Fair Hill, 3rd race, $3 on trifecta #1-4-5. 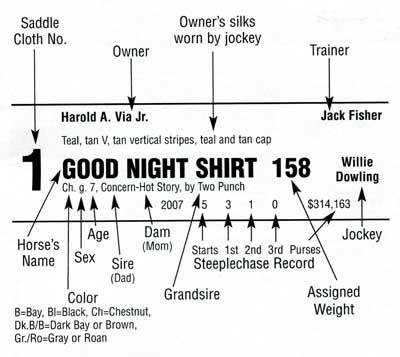 •All steeplechasers are Thoroughbreds whose lineage must be proven with official Jockey Club registration papers. Horses can begin steeplechase careers at age 3. •Most steeplechasers competed (or still compete) on the flat. 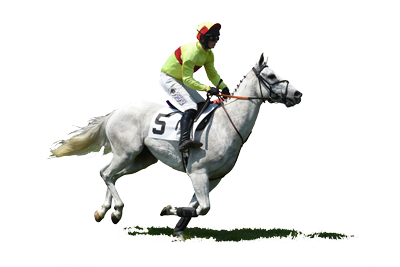 The ideal steeplechaser has speed, stamina, smarts and enough athletic ability to run and jump at the same time, in general, steeplechase horses are larger than their flat counterparts, but size is not a rule. Big horses tend to have more stamina, which is important. Horses trained for steeplechasing develop larger muscles across their backs to help with the jumping. •The best jumpers clear the fences in one long stride - much like a human hurdler jumps in track and field events. •Almost all steeplechase trainers are based on private farms, where horses enjoy the outdoors while exercising and working toward the race. •It is not unusual to see steeplechase horses compete until age 10 and beyond. At age 14, timber horse Young Dubliner won three races in 2003. •Steeplechase horses typically run six to eight times in a year. The season features no racing in January and February, plus a light summer schedule - assuring horses plenty of recovery time. Most "down time" is spent outdoors in fields. A steeplechase horse in the off-season is often dirty, hairy - and happy. •After their steeplechase careers end, horses often become foxhunters, show horses or simply pleasure rides for their owners or trainers. Hall of Famers Flatterer and Zaccio found "second lives" as a dressage horse and a foxhunter, respectively.